They first cropped up seemingly out of nowhere about six years ago, adorned in black capes with curved devil horns affixed to their heads, holding posters and black American flags as they shouted ‘Hail, Satan’ on the steps of government institutions from Arkansas and Florida to Oklahoma and Detroit. The antics and declarations seemed like a hoax to many – onlookers and journalists and politicians alike – until it became apparent that members of newly-formed The Satanic Temple were here to stay. 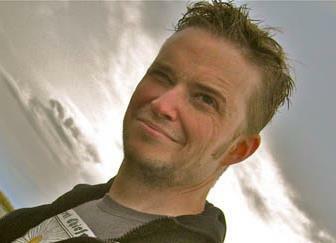 The documentary initially focuses on co-founders Lucien Greaves – not his real name, though he’s pictured on camera and has essentially become the spokesperson for TST – and Malcolm Jarry, whose face is never shown. Many members, in fact, are pixelated in footage, and quite a big deal is made of the threats to members from people opposed to their views, despite the fact that many detractors have no idea what TST members actually believe. Greaves, for example – an articulate, well-educated 43-year-old with a somewhat disconcerting eye condition – is shown putting on a bullet proof vest before a public event, as fellow temple members go over security plans to keep him safe. Because The Satanic Temple has been formed years after the devil-worship panic of the 1980s and 1990s, when a veritable witch-hunt by the far right fueled urban legends and blamed horrid crimes on followers of Beelzebub. There were multiple incarnations of Satanic-centric religions and cults going back centuries; ‘The Satanic Temple did not invent modern Satanism,’ Greaves says in the film. He refers to the Church of Satan, founded in 1966 by the flamboyant, Hollywood-esque character Anton Szandor LaVey – which billed itself as ‘the first above-ground organization in history openly dedicated to the acceptance of Man’s true nature – that of a carnal beast, living in a cosmos that is indifferent to our existence. The Satanic Temple, for example, is not afraid to take legal action when it feels that representations of Baphomet and other Satanic icons are not accurate reflections of its ethos and organization. When Netflix released its new Chilling Adventures of Sabrina series last autumn, for example, the show featured a goat-headed statue of Baphomet – very similar to a sculpture commissioned by TST – which the Temple contended was portrayed as evil. The Satanic Temple sued Warner Brothers and Netflix – and in November announced that it had ‘amicably settled’ the lawsuit, which also resolved that TST would be acknowledged in credits for pre-filmed episodes of the series. The Satanic Temple, religious studies professor R. Andrew Chesnut tells DailyMail.com, ‘actually present themselves as atheistic and really see Satan more as a metaphor. While the organization, as a whole, is unafraid of the spotlight, however, many individual members are not as eager to be identified. Most of the interviewees featured in Hail Satan?, from the top of the organization down, go by pseudonyms. Many of them, however, look as one would expect; Jex Blackmore, for example, the former head of the Detroit chapter, is a pale beauty favoring dark hair and makeup, shown in one protest dressed as a nun, her nose pierced and her attitude defiant. Blackmore, who ironically once played Eve in a middle school play, continues: ‘The story of Adam and Eve is a story of Eve’s original sin. Eve was very curious, as her nature was as a woman. The devil appeared in the form of a snake and offers the fruit of enlightenment. We are taught to fear that, but at the same time, it seems the most liberating – because if we did not have that opportunity, we would have to be in total servitude, without free choice. ‘Ultimate servitude is slavery; reframing it in the light of salvation is probably one of the greatest tricks ever played on humankind. ‘Satanism is about embracing that Satanic status, rather than being controlled by it. After I learned about The Satanic Temple, I set up a time to meet with Lucien. Throughout the conversation, I realized that we have very similar ideas of what contemporary Satanism was evolving to be. ‘The devil directly challenged God, so – as a Satanist – I believe that directly confronting injustice and corrupt authority is an expression of one’s Satanic faith – and I believe activism is a Satanic practice. That’s exactly what the temple has done over the past nearly six years. 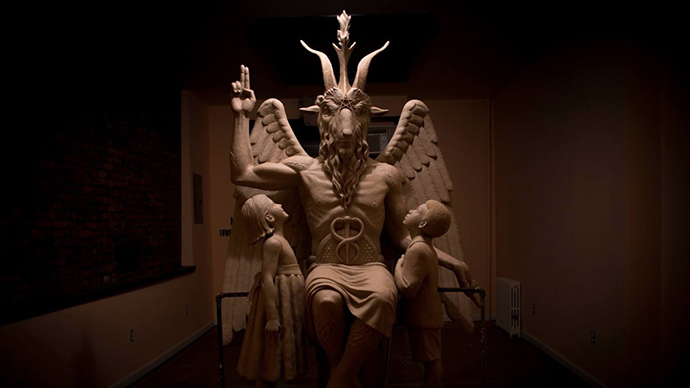 It’s fought for a statue of Baphomet – the goat demon representation of Lucifer – to be displayed on government grounds alongside the Ten Commandments to demonstrate the pluralism and religious diversity of the United States. 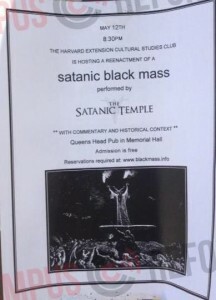 It planned a Black Mass on the Harvard campus in Boston – one of the most Catholic cities in America – to directly contravene the teachings and traditions of one of the world’s largest religions (though it was postponed and moved to a Chinese restaurant/comedy club when the Boston Archdiocese staged a massive counter march). To act out against the Baptist Church –perhaps one of the most reviled religious factions in America, which protests soldier funerals, denounces gays and basically thinks that everyone is going to hell except members – the Satanic Temple held an unholy ceremony at the grave of founder Fred Phelps’ mother. TST is nothing if not good at grabbing headlines, but Lane, through her years documenting the group, discovered additional undercurrents, philosophies and altruism embraced by the Satanic group. ‘There is a sort of sizable portion of people who, even if they are not actually religious themselves or don’t have any particularly strong kind of faith, still have kind of a negative reaction to Satanism, which is completely understandable, because we are talking about like the most reviled figure perhaps in human history,’ she tells DailyMail.com. ‘So it’s not surprising that kind of blind assumption … comes with the territory. ‘I think that we live in an era which is increasingly secular, especially amongst younger people. People do research from here to here; there are more and more younger people who are separating themselves from that kind of religious tradition of religious institutions. And there’s something really lost with that. You lose a lot. ‘Religion provides a way of healing, meaning, and organization and narrative, coherent and community and ethical kind of standards or ways we consider difficult problems of how to live your life,’ says Lane, who was raised with no religion herself. ‘That’s heavy stuff. So when you lose religion, you get a whole lot of people like myself who find themselves casting about for that kind of organizing principle. ‘In The Satanic Temple kind of reincarnation of Satanism, they set up a kind of answer to that problem that resonates for a lot of people. It’s not for everyone; it’ll never be popular, per se. If it was, it would obviate the need for its own existence. I mean, they’re supposed to be the outsider; they’re supposed to be the outsider. They’re supposed to be the kind of minority. Echoing Lane’s observations about our increasingly secular society, he says: ‘I think this also is part of this kind of burgeoning interest in alternative pagan religions, particularly among millenials and Generation Z and stuff. The most important trend on the American religious landscape is the very rapid rise of the religious “nones” – those who have no formal religious institutional affiliation – which is now 25 percent of the American population, which is now more than Catholics. I think Catholics are down to 21 percent. If we’re looking at millennials and Generation Z, the religious “nones” goes up to at least a third of the population. For a Satanic organization disavowing violence, that marked a dangerous aberration shedding a spotlight on the group it did not want. For the national council and remaining high-level executives such as Greaves, however, the real fight – at least the one they purport to support – is for religious pluralism and democracy. The TST has a site in Salem, Massachusetts, complete with a learning center and a gift shop. Chapters around the country fight at a local level against abortion and other laws which they think are opposed to their tenet of the ‘inviolable’ human body. They still believe that, if Ten Commandments are displayed on government property, Baphomet and representations of other religions deserve an equal display. They’re as likely to run charity blood drives or collect sanitation products for homeless women as they are to take part in any sort of dark ritual, the documentary seems to indicate. She adds: ‘I, frankly, always felt completely mystified and baffled by the existence of religion. I really didn’t ever understand what it was good for – and making this film has really, really challenged that for me … and transformed my understanding. 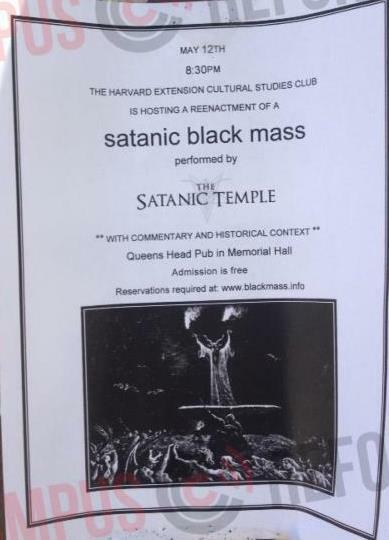 For his part, Greaves – the most recognizable face of TST – says: ‘This is the infancy of The Satanic Temple.